Breaking News: Big Foot Is Real! But in this case....I'm referring to our online presence! Not the North American folktale. In Network Narratives, we discuss the digital imprint we are leaving in this world. The information we readily share and the information we share without realizing. As an adult, I am still figuring out this digital age we live in. I used to feel like I grew up with technology, having gotten my first cell phone at thirteen, but in reality, that's nothing compared to kids today. The days of AIM and away messages, as harmless as they seemed but I'm sure were not, have been replaced with Snapchat, and Fortnite. I asked a student to text her friend about an assignment she missed and the girl laughed saying, "Oh we don't text anymore," as she rolled her eyes. "We Snap." Apparently you can DM through snap chat and that's how they communicate. They also can now Face Time through Snap chat. I don't know sometimes I feel like the less I ask, the better I'll feel! But I know that's not true. It's my job to teach them. But...it's become more and more frustrating in recent years because people expect teachers to do it all. In today's world, I am also responsible for teaching them digital citizenship. Which I agree with. They are young and they need guidance and I am there to give it. But in a world where most adults don't practice safe practices online, how do we reach kids? I've heard people say that in terms of digital footprints and surveillance, that we need to start in the schools, but I haven't heard any solutions. So I did some research on my own and came across this article by Kathleen Morris. She is a primary school teacher in Australia who chose to blog about digital citizenship after seeing how much it impacted her teaching. Morris discuss the fact that talking to students, as both educators and parents, must be an ongoing discussion. She also provides tools for teaching within in the article that are worth checking out! 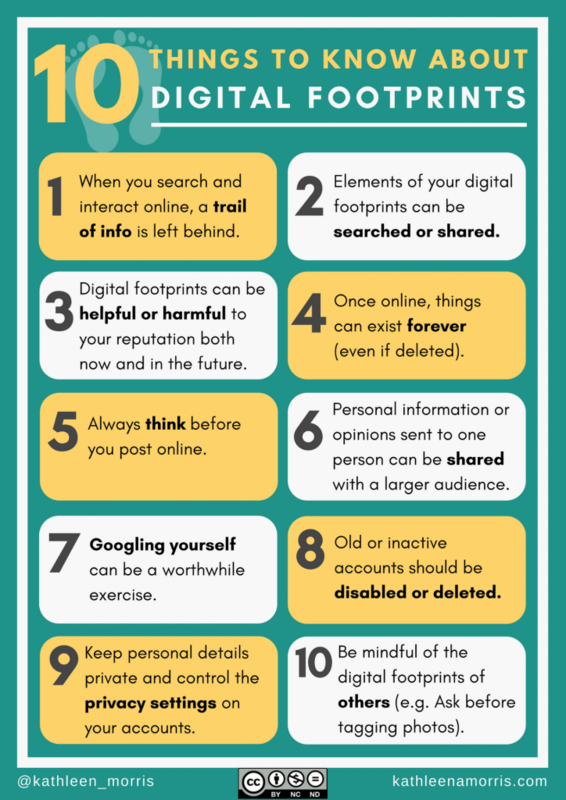 But she summarized her points into one poster "10 Things to Know About Digital Footprints". The first point she makes is that we need to instill positivity and not fear into our students in regards to their online presence. There are many wonderful things that can come from connecting with a network online, and as children, they are naturally curious and creative, which is our job to foster, but in a safe environment. We teach them from a young age not to share their full name, address, and other personal details online. I know that I also learned about what pictures to share. But Morris also addresses the importance of thinking before you post in terms of your opinions. The countless posts I see on social media where people, who are educated, express their opinions in unintelligent ways, is mind boggling. It has to start with us people! We need to look long and hard at what we are posting and teach our kids that what they post now may not reflect who they are in later years, BUT it is still out there. It may seem abstract to them now, but the reality is it's their future. What they put out there at thirteen could very well come back around at twenty five or later. I saw Bigfoot recently in a video, he is looking rather good these days ;-) I like the way titled and set up the post. The article and infographic you shared looks very useful for the guide, especially about coming from a positive perspective. The 10 points seem reasonable, but would you say they are widely practiced? If I Won't WebMD it-Don't WebMD Me!